With the belief that people grow through their work, we develop employee skills and competencies by effectively combining core training by workplace managers on the job, with supplementary, off-the-job education and training, self-development and transfers as well as job rotations. We also provide opportunities for discussing career plans and the Open Recruitment program so that employees can experience a sense of self-fulfillment and satisfaction through their work. DFF Inc., Corporate Social Responsibility Sect, General Administration Dept., Corporate Planning Dept., Resources & Global Business Division, Energy Solution Div, Power Buisiness Dept., Pipeline Network Division, IT Division, Residential Sales Div., Fundamental Technology Dept., Energy Solution Div, Environmental Affairs Dept., Purchasing Dept. 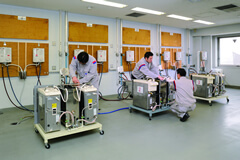 , Health Insurance & Employees' Welfare Sect., Personnel Dept., Internal Audit Dept., Audit & Supervisory Board Member's Office, Compliance Dept., Regional Development Div., Finance Dept, ＴＧＥＳ, TOKYO GAS COMMUNICATIONS, INC.
Tokyo Gas takes a two-pronged approach to training personnel: developing basic and common skills required of a businessperson and enhancing specialized skills. We strive to develop highly competent employees who can think independently and motivate others to join them while flexibly adjusting to changes in the business environment by expanding, heightening and increasing the skills required for each contribution type. 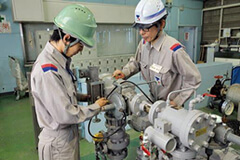 We will strive to boost productivity driven by the development of individuals and the leadership they demonstrate at Tokyo Gas by maximizing every employee’s capabilities and strengths. In addition to job transfers and rotations aimed at encouraging professional development, we provide training in basic education, management skills and career planning. 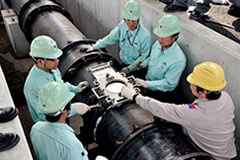 Part of the training engages Tokyo Gas Group employees in developing common skills as well as a sense of cohesiveness within the Group. Management Skills Development For managers and recently promoted employees. Develop an awareness of expected roles for each contribution type and level of employment as well as enhancing management skills. Next Generation Leadership Development For managers. Provide training based on collaboration and interaction with other companies to develop leadership with the broad perspective and vision essential for times of change. Human Network Development Active intra-departmental discussion-based programs for management, directors and their subordinates from various divisions to enrich and broaden leadership vision and perspectives as well as network development. Global Adaptability Development Develop internationally competent professionals who can excel in both domestic and foreign markets through global leadership development, enabling participants to experience global business, OFF-JT, including internship programs at overseas companies, and self-development support programs. Study Abroad Program We encourage our employees to study at graduate schools and technical schools, both in Japan and overseas, so that they can broaden their views, obtain business-related skills and develop extensive networks toward comprehensively contributing to our business. Self-Development Support Program We provide seminars, external training, online training and other types of education to support employee self-development. The programs encompass the purpose for increasing their expertise and other typical content such as skills for developing goals, collaboration skills and task management. 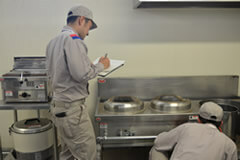 We implement divisional and cross-divisional training to develop particular specialty skills required at each division. 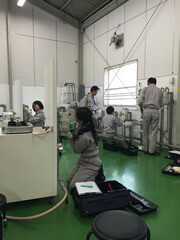 Our human resource development center delivers training to employees of the Tokyo Gas Group and partner companies working in the residential services sector. In fiscal 2017, we offered approximately 160 courses (1,275 sessions in total) taught by nearly 60 instructors, including current and former employees as well as those from Group companies. 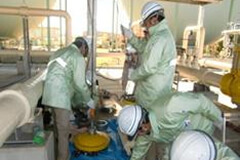 In collaboration with the related departments, we set up an internal qualification program and provide technical training in areas such as safety inspection, equipment repair, installation of gas appliances and water heaters, and gas installation work in order to guarantee the quality of our residential services sector business. 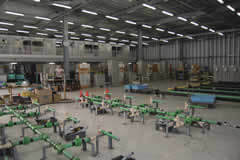 We offer basic knowledge and mindset training to remain the customer’s number one choice. 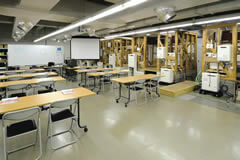 We also offer e-learning courses as a convenient way for participants to renew qualifications. Our Pipeline Network Division identifies desired skills and implements the related training toward establishing a foundation of essential competencies from a mid- to long-term perspective. In order to maintain and pass on technical skills, we strive to improve specialty skills through OJT based on daily instruction as well as OFF-JT conducted by training centers and other sources. We have introduced a recognition program for supporting every employee in obtaining the required skills and technical ability to take full responsibility for attaining a level of job performance that will satisfy both our customers and society at large. The program is structured in a way that enables personnel to perform their work at a consistent level of skill and technical ability. This fundamental system allows us to continuously fulfill our responsibilities to customers and general public. This in-house qualification program supports our human resource development efforts by recognizing highly skilled personnel in order to improve workplace skills and effectively pass on technical abilities to the next generation. 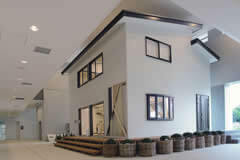 It is intended to clearly define the ultimate professional for handling tasks such as emergency safety, maintenance and construction management so that younger employees will strive to raise the level of their technical skills up to that of “Meister” instructors. We also require Meisters to recognize their responsibility to pass on their skills to younger personnel. 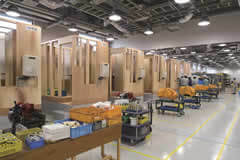 OFF-JT is provided at four centers designed to develop specific tasks in each line of work. We provide staff from our Group and partner companies with regular training in such areas as basic induction skills, work performance improvement and common core skills. We also offer custom training, offsite programs, training tools and video lending, open access to facilities and other channels for various training needs. All of these training opportunities are administered through our STUDY II system (qualification management system for the Transmission Training Center). 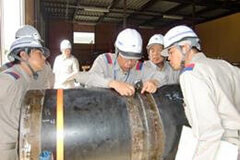 Employees of the Tokyo Gas Group and partner companies can use the system to apply for training, and information on the system can be transferred to other systems, which helps employees manage their personal development documentation. 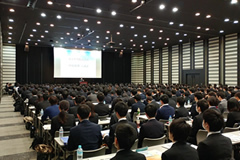 In April 2018, we hosted the “The Tokyo Gas Group Mindset Orientation,” focused on new employees. The program included lectures on our main policies, customer satisfaction, compliance, human rights, the environment, diversity and CSR to develop a strong group awareness and sense of unity. Mai Minakami, a para swimming athlete who works in our Personnel Department, delivered a welcome speech to new employees describing her views on balancing work and competition as well as challenges for the future. We endeavor to place the right person in the right place so that employees will find their work rewarding. Every year, employees have an interview with their supervisors to discuss their career plans. Their self-evaluation along with remarks by the supervisor is registered in the personnel system and incorporated into decisions related to transfers and rotation plans as well as career development. We establish an Open Recruitment program and Free Agent program to supplement our ongoing personnel transfer program, and we enable employees to apply for the position of their choice.